One reason is that some friends have needed some support (a whirlwind of mindblowing medical drama hitting the family) so plugin development had to take a back seat. Being the thorough person that I am, I’m aiming that the new plugin will allow one to create whatever repeating event one wants to create. For example: events that repeat every 5th x day of the month. Some examples of all the wild and wonderful possibilities to allow and test for are here and here (scroll down to the rrule). This means that a fairly sophisticated event entry form is required that can be simple, but can also expand to allow for the more interesting specifications. At first this meant at least allowing “Select multiple” input and so I coded the select and validated it. Then I added the multiple…. I could not get it to work in firefox. At first, I drove myself batty thinking I had the wrong syntax, maybe the css was stuffing it up? maybe the php code was wrong etc, maybe the wordpress code was interfering. Every time I made the validated SELECT a “multiple”, the dropdown arrow disappeared, making the input non functional. A quick bit of googling showed that maybe there was a firefox problem there. Other browers were handling it better. Able to specify 5th x day of week, Looking at this image - do we need to allow for the -5? ie: the first x day, but only if there are 5 of them in the month? GroundHog Day! So now I had some complicated radio and checkbox php and html happening. Again it was driving me nuts, random buttons were shown as on, when they should not have been. I kept thinking it was a bug in my code (ok there were some to start, which is why it is godd to keep validating the code). 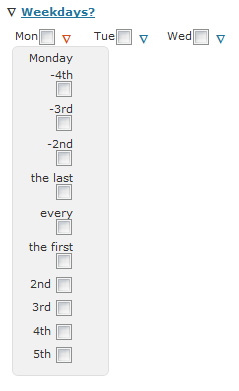 Then I found that firefox was happier if it had some MORE html bracketing the sets of checkboxes, so I gave it more. Actually I think the nested checkboxes inside another checkbox fieldset were what broke it. More fieldsets sorted it out.. Chrome, Safari and IE seemed OK either way. I love the debugging add-ons in firefox (firebug and web developer) and have not been able to comfortably replicate those in other browers. Normal I would test it out more to find a workaround, but I had already wasted hours and felt I needed to move forward with the developement. If anyone has any info to shed on either of these and how to get around them, please let me know – post a comment below.